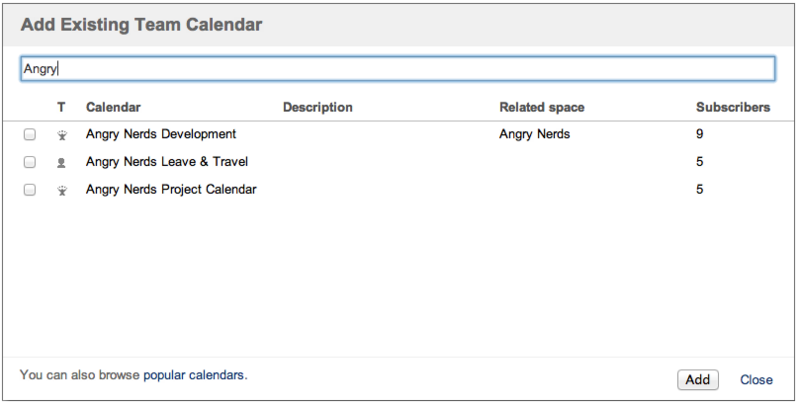 The Atlassian Team Calendars team is pleased to announce the release of Team Calendars 2.4. This release was mostly focused on making the calendar creation and embedding experience much more simpler and intuitive. For those of you that might not know, the only way to create calendars prior to this release was to go to your "My Calendars" screen (linked from the dashboard or from your username menu). Then, if you wanted to embed a calendar in some content, you'd have to go to a page, search for a calendar using the calendar macro. We've heard most of your feedback about this and have streamed the process, making it much easier to do this. 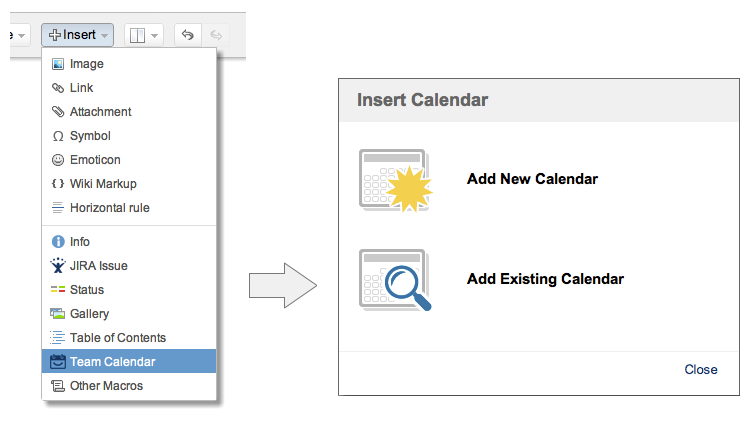 You can now create, find and embed calendars from the Confluence editor. Creating calendar mashups on the same page can be quite helpful. For example, you may want to embed your team leave calendar alongside your JIRA project release calendar to see how your teams availability could impact your release. Thanks for the suggestion, Kristyn Souder! Improved the search experience in the macro browser, with better calendar suggestions and autocomplete. Reminder: Team Calendars 2.2 was our last feature release for Confluence 3.5.x. Only critical bug fixes will be ported back to Team Calendars 2.2.x. These new features are available on Confluence 4.0 or greater. Please watch the Team Calendars Release Notes to stay updated of any announcements. This release also had some improvements made to the JIRA integration feature. 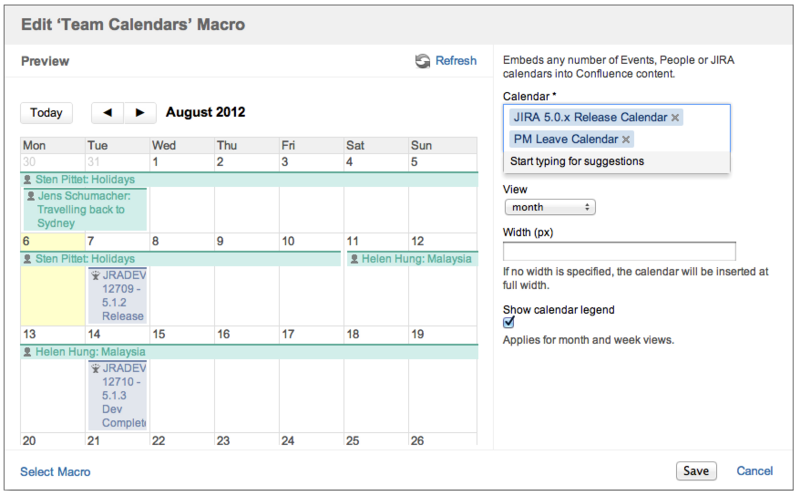 For JIRA customers, you will also want to upgrade the Team Calendars JIRA integration plugin in JIRA. To do this in JIRA, simply click 'Upgrade' in the jira-ical-feed entry of the Plugin Administration screen. Alternatively, download the latest release from our plugin exchange and install it via the Plugin Administration screen. 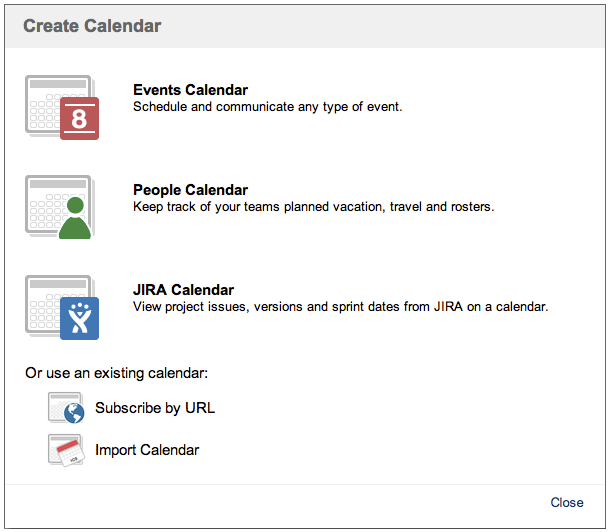 This should upgrade Team Calendars for JIRA to 1.0.9 (or higher). Note: The JIRA plugin upgrade is completely optional and not required if you are not using JIRA Calendars for Team Calendars.